As Griffin continues to grow and expand its transportation and logistics services product offerings, it has continuing needs for high-caliber, service-oriented individuals seeking career opportunities. Griffin provides a work environment where individuals become part of an overall team, dedicated to providing quality transportation services. At Griffin, employees make a difference, and they are provided opportunities to develop their talents, learn new skills and impact results. Griffin recognizes the value of a high-performing workforce by having competitive employee compensation and benefits programs. Experienced, over-the-road (OTR) drivers are essential in the delivery of quality transportation services. At Griffin, drivers are at the forefront of the transportation service process. 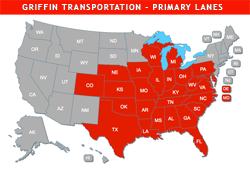 Because drivers are instrumental in delivering reliable, on-time and safe service, Griffin is a company that cares about its drivers and their families. Drivers are a highly-valued and respected part of the transportation service team at Griffin. Please see Current Openings for current employment opportunities at Griffin.